Marjutin neuleet: Thanks to my NHV#3! Felted flowers! 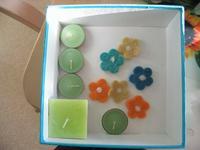 Scented candles! And, of course, when you have candles you need matches. 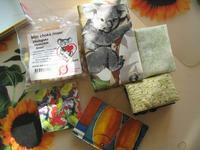 The soft boxes on the right contain matches - and here's another connection: one match box is covered with koala fabric and the bag contains ecological chocolate with a koala on the label. (Yummy! We already ate the rest of the candy, by the way.) By the way, I love koalas, they look so cuddly and cute. Oh, and there are also two small notebooks. 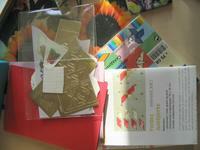 The a chance to broaden my horizons: paper and instuctions for folding (may I call that origami? 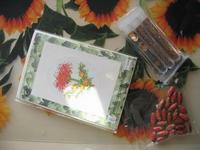 ), some materials for card-making, beads and sequins and... a small cross-stich kit.